Chose what you need above! 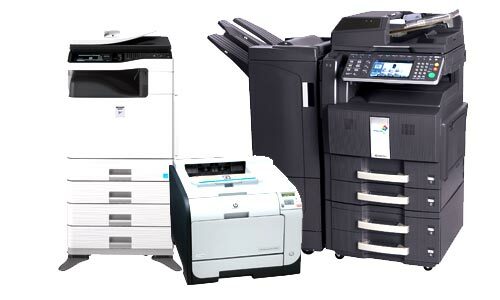 If you’re using a laser printer, inkjet printer or multifunction device and find that they no longer meet your needs, it may be time to upgrade to an office copier. Give us a call and we’ll be happy to discuss your options. For many businesses a multifunction printer is enough to handle their printing, copying and faxing needs. If you’re a business that needs to produce high volumes of output, an office copier may be a good investment. A standard office copier offers higher print speeds than a multifunction device; advanced models can handle up to 90 pages per minute or more. A copier capable of handling paper sizes up to 11×17 may be more costly up front, but can offer a much lower price per page. You may find that a standalone copier may be exactly what your business needs to reduce downtime and increase productivity. Upgrading your office print environment to include a standalone copier? We’ve helped hundreds of local businesses find the perfect office copier to fit their needs and we can help you too. A quality copier will improve productivity with faster copy speeds, improved print quality, and all for a lower cost per page. You’ll free up time and money to focus on what’s important for your business instead of dealing with printing problems and bottlenecks.